Locksmith in Welwyn Garden City | 24HR Call out | Locked out? Access Denied Welwyn Garden City Locksmiths offer 24 hour 7 days a week service with call outs made within 30 minutes. We also pride ourselves on our services meaning Access Denied Welwyn Garden City Locksmiths only uses the top brands of locks and we guarantee to offer the best price. If you’re looking for a locksmith in Welwyn Garden City, we can help. At Access Denied, we are proud to offer a range of different locksmith services to those in Welwyn Garden City and the surrounding areas. So, whenever you run into a problem with your locks, you can count on us to help. Though a number of our competitors offer one or two services, we offer much more. As a locksmith in Welwyn Garden City, we firmly believe we should be able to offer the full range of locksmith services and that’s exactly what we do. For example, our services extend to include both auto locksmith services and those that are aimed at properties, homes and businesses. This means you can use Access Denied time and time again, even when your problem changes. There’s no need to find a new locksmith in Welwyn Garden City, as you have us. At Access Denied, we always strive to provide our customers with an unmatched service. With a team of dedicated individuals and a great deal of experience, we are able to guarantee a high quality service and a great deal of professionalism. However, as well as focusing on being professional, we also always try to keep things friendly. We know that a problem with a lock can be stressful and you’re bound to have questions, so we want to be approachable. Every one of our locksmiths is completely mobile, meaning we are able to travel to you. Rather than you having to worry about travelling to us, you can sit back and wait for us to arrive. It’s thanks to our state of the art equipment and technology that allows us to provide a mobile locksmith service, as we’re able to take everything with us wherever we go. Choosing a locksmith in Welwyn Garden City can be tough, especially if you’re not entirely sure what you should be looking for. So, keep things simple and choose Access Denied. You’ll find us to be reliable, respectful and ready to work. Plus, all of our services are affordable and great value. If you ever find yourself locked out in Welwyn Garden City, try not to worry. Though being locked out in Welwyn Garden City can be stressful, help it never too far away. At Access Denied, we have a great deal of experience with helping our customers who have found themselves locked out. This doesn’t just refer to being locked out of home, but locked out of a vehicle also. To keep things simple, if you’re ever locked out of your car or your home contact the Access Denied team. We always have a locksmith in Welwyn Garden City who can help. If you’re lucky, you won’t have been locked out before. However, this may mean that you haven’t thought to have a spare key cut. So, unless you have someone else to let you in, being locked out can cause problems. Being locked out is likely to put a halt on your day, as you can hardly continue on without access to your car or home. Luckily, it doesn’t need to be a problem that lasts for long. With the help of a professional locksmith in Welwyn Garden City, you’ll have access back in no time. As with all of our services at Access Denied, we take pride on helping those who have been locked out. We work hard and we work quickly, as we know that the quicker we work the better it is for you. Plus, with our wealth of knowledge and skill, there’s rarely anything that holds us back. Every single one of our locksmiths is well trained in a range of locksmith services, meaning we’re able to tackle anything. Regardless of which of our locksmiths you deal with, you’ll be impressed with the service. Though Welwyn Garden City is a large area, it’s an area we’re able to cover with ease. This is because we are completely mobile and can help you, wherever you are. Whether you’re locked out of your car in a supermarket car park or you’re locked out of home in the countryside, it won’t take us long to reach you. In fact, we’re confident in our ability to get there in record time. There are a number of reasons as to why you may need a lock replacement in Welwyn Garden City. Luckily, Access Denied are able to help under any circumstance. Whether you need a new car lock or a new lock for your home, we’re able to help. At Access Denied, we take pride in offering the full range of locksmith services and this includes lock replacement in Welwyn Garden City. A lock replacement is one of the very best ways to increase the security and safety of a home or vehicle. After all, it is the lock that keeps unwanted visitors and users out. However, not all homes and vehicles have good locks. This is where a lock replacement could come in useful. If you have recently purchased a new home or car, you may consider upgrading the lock to ensure you are the only one with access. Similarly, if you have recently lost a key, you may consider upgrading the lock to ensure no one else is able to get in. Additionally, a lot of our customers simply want to upgrade their existing locks to boost security. After all, old locks tend to get stuck and old keys are rarely as secure. If you are looking for a lock replacement, you’ll need a professional locksmith in Welwyn Garden City. This is where we come in. At Access Denied, we have replaced a large number of locks over the years and therefore we really do know what we’re doing. We are even able to assist with the more unique, complex and unusual locks. Whatever it is you need, we have a great locksmith to help. When you choose Access Denied for your lock replacement needs, you are choosing a team of professionals. With a passion for what we do and a great deal of experience, we are able to provide a high quality service every time. You’re sure to be happy with our locksmith services. In fact, a number of our customers come from recommendations and referrals, meaning our service is so good people want to recommend it to others. You may not have considered that a key snapping in a lock could be a problem. After all, keys are strong and therefore are unlikely to snap, right? Wrong! A lot of people find themselves with snapped keys and no idea what to do. Luckily, the Access Denied team are on hand to help. At Access Denied, we understand the problems that a snapped key can cause and therefore we work swiftly to solve the problem. Whether it’s a key snapped in a car lock or a key snapped in a house lock, you can count on us. Though older keys and locks tend to suffer more problems, there’s no telling when a key is likely to snap in a lock. This is why it often comes as a surprise. If you are in Welwyn Garden City and your key has snapped in the lock, you’ll need to seek the help of a professional locksmith. With the correct tools and specialist training, our locksmiths are able to solve the problem. All of our locksmiths are skilled and experienced in providing a range of different locksmith services, including helping out when a key has snapped in a lock. This skill and experience allows us to do a great job every time, with passion and hard work thrown in. We know that being without a working lock is stressful, which is why we ensure the job is done as soon as possible. Even if it’s a complex lock or a key that’s difficult to replace, you can relax knowing the problem is in good hands. At Access Denied, everyone is reliable. Whether it’s a key snapped in Welwyn Garden City or a replacement lock that’s needed somewhere else, you can count on our team of professionals here at Access Denied. For more information on finding a locksmith in Welwyn Garden City or to find out more about us, get in touch. Call us today on 07534 277020 for a no obligation quote or for more information on any of our services. Alternatively, get in touch online and speak to a member of the Access Denied team. This is not a problem and is the most common reason we get calls. Our non-destructive methods of entry mean we can open your car in no time at all. Call us now for a call out in as little as 30 minutes by one of our Welwyn Garden City Locksmiths from. 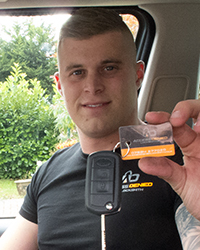 Access Denied Auto Locksmiths in Welwyn Garden City can provide new keys for your car created to the highest of standards again within as little as 30 minutes. Our fully trained team are 24 hour emergency auto locksmiths so you can get to us when you need to. Our Auto Welwyn Garden City Locksmiths will always be prompt and professional regardless of the time of day that you call on them. Access Denied have trained staff working all over Welwyn Garden City meaning a member of the team of Auto Locksmiths is always within 30 minutes of reaching someone when they call. We will never make you wait longer than necessary to help you out. When you are locked out of your vehicle, your home or your work place, time is of the essence. That’s what makes Welwyn Garden City Locksmiths the number one choice for a locksmith in WGC. Our local presence means we can respond to customers quickly and efficiently, providing the skills and expertise to cover a wide range of requirements. We are the locksmith Harlow has been waiting for, with a policy of no call out fees, and only charging for the labour and parts we provide. With Welwyn Garden City Locksmiths, what you see is what you get – that means no hidden add-ons, and an assurance that what we quote you over the phone is the price you will pay. we will address them immediately. If you live in the AL7, AL8, AL9 areas, Welwyn Garden City Locksmiths are your go-to service for all manner of key and lock repairs and replacements. We offer unrivalled expertise and a high level of worksmanship, but that doesn’t mean our prices break the bank. Our pricing structure has been designed to be super competitive, so expect our rates to compare favourably with similar services in the area. Complications with keys and locks – such as damage, loss or theft – can happen at any time of the day or night. For this reason, Welwyn Garden City Locksmiths provides a 24/7 offering, meaning if you require a locksmith near Welwyn Garden city or in the town itself, we will be at your service in no time at all. Our friendly team of customer advisors are accustomed to dealing with all kinds of scenarios and will be able to advise you on the best and most secure way forward. Whether you have lost your keys entirely, or misplaced them, we understand the importance of you solving the problem and resuming your day. not only providing you with a new set of keys but also a set of replacements in double quick time. We protect you from individuals attempting to gain unauthorised access by refitting your lock if necessary, ensuring your old keys will not work, whichever hands they fall into. Need your lock or keys replacing? Call us 24/7 on 07534 277020.